We’d love your help. 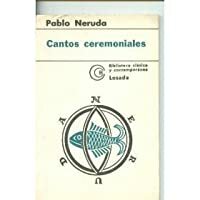 Let us know what’s wrong with this preview of Cantos Cerimoniais by Pablo Neruda. Poucos poetas celebraram tão amplamente a vida como Pablo Neruda. Publicado em 1961, após uma forte fase política na obra do autor chileno, Cantos cerimoniais é a síntese deste espírito de comemoração das coisas do mundo. É fruto da maturidade do poeta, com versos escritos em um momento de tranqüilidade na vida de Neruda. Os temas visitados são variados: o exorcismo do pass Poucos poetas celebraram tão amplamente a vida como Pablo Neruda. Publicado em 1961, após uma forte fase política na obra do autor chileno, Cantos cerimoniais é a síntese deste espírito de comemoração das coisas do mundo. É fruto da maturidade do poeta, com versos escritos em um momento de tranqüilidade na vida de Neruda. (...) e outra vez na mesma mesa está o mar,/ Tudo está como esteve disposto nas ondas,/ seguramente assim seguirá sendo.// Seguirá sendo, mas eu, invisível,/ alguma vez já não poderei voltar/ com braços e mãos, pés, olhos, entendimento,/ enredados na sombra verdadeira. To ask other readers questions about Cantos Cerimoniais, please sign up. While I am primarily reading it in English, the translator seems to have done an amazing job. I really like the side by side English/Spanish of each poem, it gives a fuller feel to the words. Neruda is one of my favorites, and I am just going to say it. Neruda is best read in the bath. It's true! Try it. I can taste these words, love songs to the sea and the land. I can only dream of writing words like these. Nothings captures a life on the sea, a life filled with love of the wilderness, while still touching on love and political turmoil like the poems of Neruda. He wrote my life before I was born. I wont lie, Neruda lies behind 40% of my own poetic voice. The sort of God's Eye view that he takes is amazing, best I can attempt to describe it with little time for a proper review. Pablo Neruda was the pen name and, later, legal name of the Chilean writer and politician Neftalí Ricardo Reyes Basoalto. Neruda assumed his pen name as a teenager, partly because it was in vogue, partly to hide his poetry from his father, a rigid man who wanted his son to have a "practical" occupation. 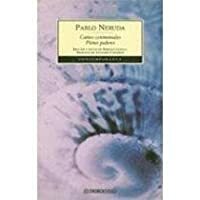 Neruda's pen name was derived from Czech writer and poet Jan Neruda; Pablo is thought to be fro Pablo Neruda was the pen name and, later, legal name of the Chilean writer and politician Neftalí Ricardo Reyes Basoalto. Neruda assumed his pen name as a teenager, partly because it was in vogue, partly to hide his poetry from his father, a rigid man who wanted his son to have a "practical" occupation. Neruda's pen name was derived from Czech writer and poet Jan Neruda; Pablo is thought to be from Paul Verlaine. With his works translated into many languages, Pablo Neruda is considered one of the greatest and most influential poets of the 20th century.